Especially in the case of Nilotinib, patients are formally advised not to eat two hours before and one hour after taking the medicine. In food-effect studies about 10 years ago, volunteers have been asked to take Nilotinib with food, and then blood levels of the drug were measured over a period of time. Those food studies revealed that peak concentration of Nilotinib was more than double (112%) than compared to taken while fasting. The overall drug exposition (“area under the curve”) of the drug increased by 82%. The food effects were stronger on high-fat meals than on low-fat meals. Increases in blood levels can cause strong unwanted side effects similar to an overdose, and because Nilotinib has some risk of causing cardiovascular side effects, overdosing should be strictly avoided. This is why the label of the medicine requires fasting periods before and after the intake of the medicine. According to the package leaflet, only those “patients who are unable to swallow hard capsules, the content of each hard capsule may be dispersed in one teaspoon of applesauce (puréed apple) and should then be taken immediately. Not more than one teaspoon of applesauce and no food other than applesauce must be used”. The twice-daily dosing of Nilotinib in the absence of food is a considerable burden for patients with CML. Even though there is some flexibility to administer the drug in a time window of 10-14 hours, the fasting periods can influence the patients’ social life, and returning to the “new normal” can be quite burdensome. The CML Advocates Network’s Adherence Survey has also demonstrated that adherence on Nilotinib is worse than on the other TKIs, which may be a result of the regimens. Public data about Nilotinib’s food effect data is scarce. Some pharmacokinetic information, which describes the mechanisms from intake of the drug to conversion into the blood, is available in the “Summary of Product Characteristics” on the EMA website, which was submitted with the application for marketing authorization in 2007. Various food effect studies undertaken by the manufacturer between 2006 and 2014 to overcome food effects of the drug through different formulations (including capsules, tablets, slow and fast release mechanism) were unable to overcome the effect. 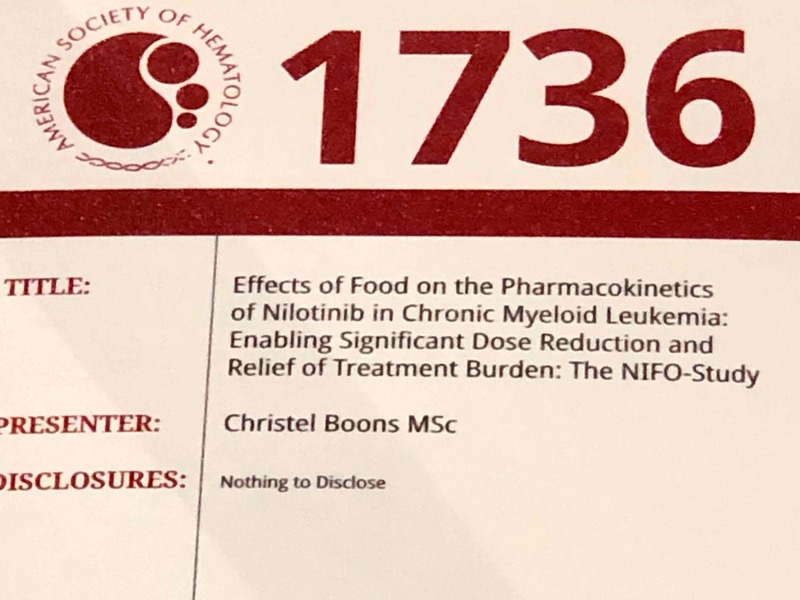 However, at this year’s ASH congress, a poster on the “NIFO Study” (NIlotinib with FOod), conducted by the academic Amsterdam Medical Center, was published. The aim of the NIFO study was to further investigate the food effects on Nilotonib simplify the dosing regimen and reduce treatment costs while taking advantage of the food dependent bioavailability of Nilotinib. In the study, the researchers investigated the effects of real-life food consumption on the pharmacokinetics of Nilotinib in chronic phase CML patients. Nilotinib 300 mg twice daily was administered under fasting conditions (reference treatment) was compared with Nilotinib at a reduced dose of 200 mg twice daily under fed conditions (test treatment). The type of food intake was not standardized, in order to increase implementability in general practice. However, to ensure the intended increase in bioavailability of the drug through its food effects, the size and composition of the meal were verified and food intake was increased if necessary. Blood samples were collected at two days during each of the two treatments, with time points at 1, 2, 3, 4, 6, 9 and 12 hours after Nilotinib intake in the morning and 1, 2, 3, 4 and 12 hours after Nilotinib intake in the evening. Blood plasma concentrations of Nilotinib were measured. Bioequivalence was concluded within the equivalence limits of 80%-125%. Adverse events were recorded by means of a patient diary and electrocardiogram monitoring. Quality of life was measured using EORTCs QLQ-C30 and QLQ-CML24 questionnaires. Fifteen patients aged 40-74 years participated. The arithmetic mean concentration-time profiles of the two dosing regimens studied are shown in Figure 1. Nilotinib absorption was somewhat delayed following the administration of Nilotinib with food. The geometric mean values for Nilotinib drug exposure (“Area Under the Curve” 12 hours after intake, AUC 0-12h), minimum blood concentration (Cmin) and peak blood concentration (Cmax) following morning intake with food decreased by 11%, 12%, and 10%, respectively. Following evening intake, the geometric mean values for drug exposure (AUC) and peak blood concentration (Cmax) decreased by 16% and 20%, respectively, and increased by 6% for the minimum blood concentration (Cmin). For both dosing regimens considerable intra- and interindividual differences in Nilotinib pharmacokinetics occurred. No cardiovascular-related QT-interval prolongations were observed, and for both regimens the frequency of adverse events was similar. The symptom burden (measured with the EORTC QLQ-CML24 Quality of Life questionnaire) was significantly better for the intake of Nilotinib with food, even though the data here is limited to examine improvements in quality of life, as the intervention period was only seven days. As a conclusion, the authors of the study remark that using Nilotinib at a reduced dose of 200 mg twice daily under fed conditions in patients with chronic phase CML seems feasible and safe. Bioequivalence, however, was not completely conclusive. In spite of somewhat decreased pharmacokinetic parameters, bioequivalence was established in terms of drug exposure, minimum and peak blood concentrations following morning intake. Following evening intake, bioequivalence was established in terms of minimum blood concentration, but not of drug exposure (AUC 0–12h) and maximum blood concentration. In addition to monitoring high intra-patient variability, it is advisable to use therapeutic drug monitoring when implementing the intake of a reduced dose of Nilotinib with food in clinical practice. 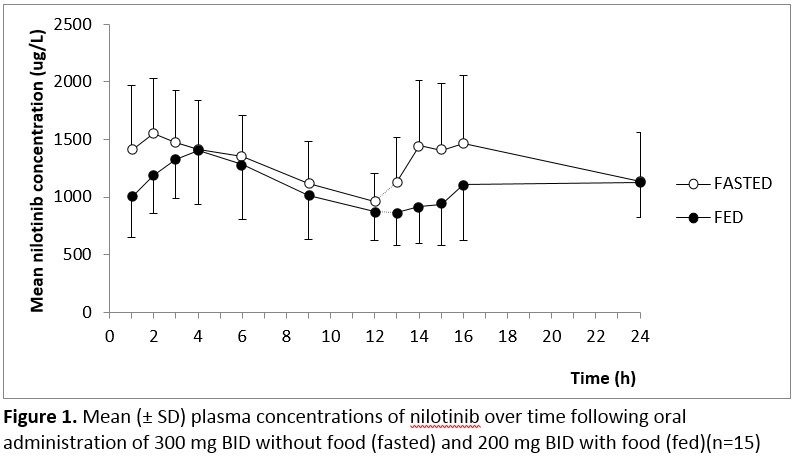 It is really interesting to see data on using lower doses of Nilotinib by at the same time increasing drug exposure through food, potentially reducing the patient burden on quality of life due to the very strict fasting regimen of Nilotinib. However, it is strongly advised not to misinterpret this publication as a recommendation for using lower doses with food, as individual patient variations of drug exposure, peak blood concentration and minimum blood concentration seem to be significant – so it can’t be predicted whether the drug exposure and drug levels will meet the same levels as when taking the recommended dose while fasting. The number of patients as well as observation time, as reported here, was also very small, so it is premature to take any conclusions whether this is safe, and which type of food may lead to comparable drug levels. The good news of this study is that the Amsterdam Medical Center is moving on with this research, and with more data, this may open therapeutic options for those patients whose dietary restrictions, lifestyle factors and individual drug intolerances may make switching treatment to a different TKI or adherence to the fasting periods of Nilotinib difficult. It may also be important research for patients in countries where the financial impact (self-payment of the therapy creating an existential burden to the family) may be prohibitive to using the recommended full dose of Nilotinib.